Mitäpä sitä muuta sanomaan kuin että olipas taas sitä itseään tuo peli ja nihkeääkin nihkeämpi voitto tuloksena. Polski sai kuin saikin paikkansa ja teki 1-2 voittomaalin. Siitä olen samaa mieltä, että Biglia paukutti hienosti vaparin sisään. Olikohan Milanin kauden ensimmäinen suora vapari maali. Yleensä ne Milanin yritykset ei ole lähelläkään maalia, ei ainakaan vastustajan maalia. No joka tapauksessa siitä olen eri mieltä, että Biglian syöttötyöskentelyssä olisi paljon parjaamista. Ihan eri tasolla se on kuin Bakayokon. Muutenkin Biglia pelasi ihan hyvän pelin ja on minun MotM. "At the end of the match, he and Meggiorini cleared things up. Such things can happen on the pitch. Gattuso's presence on the bench is important and he gives us something extra." "We could have managed the situation better for the Chievo goal. We knew what difficulties we would face. This team has awareness now and it can certainly improve further, especially when opponents get into our half. All of our quality must come to the fore." "What the guys are showing on the pitch goes beyond their technical ability. Attitude is making a difference, like when we see the two wingers making sacrifices to get back and help out in defence." "As Gattuso has said, Lucas is an important player for us on and off the pitch. We're very happy that he had a great performance today and that he was able to score." "For us, every game is a final. We know how strong Inter are, I'm sure that we'll be ready for this great game." Viikon päästä on sitten se derby. Inter on ollut ihan sekaisin viime aikoina, mutta jos Milan ei paranna huimasti, niin tämä Milanin voittoputkikupla hajoaa räjähtäen. No joo, ei se Biglian syöttely niiiin huonoa ollut, mutta pari karmaisevaa pallonmenetystä oli lahjoittaa maalin-pari kotijoukkueelle. Ja pitää muuten kerrankin kiittää tuomareitakin. Olin 100% varma, että Piatekin maali hylätään, mutta joskus näinkin. Chievon leirissä ollaan taas sitä mieltä, että molemmat Milan-maalit olisi pitänyt hylätä, mutta ensimmäisessä nyt ei ollut mitään selittelyä. Ja tosiaan varmaa on, että näillä otteilla ei Inter kaadu. Hakan Calhanoglu on valittu Turkin mukaan. Davide Calabria ja Patrick Cutrone Italian U21:n joukkueessa. Ja Susoa ei valittu Espanjan mukaan. Huomenna pelataan maailman kaunein derby, Derby della Madonnina. Siinä Milan saa vastaansa naapuriseura Internazionalen, eli Interin. Matsi pelataan tutusti San Sirolla klo 21.30 Suomen aikaa. Matsi on kiinnostanut ja Milan on myynyt lippuja 5,7 miljoonaa euron edestä.Tämän lisäksi peliin on tulossa noin 260 kirjoittavaa toimittajaa, 60 valokuvaajaa ja yli 300 tv-puolen työntekijää. Kuten calcion seuraajat tietävät, niin kyseessä on uskomattoman tasainen pari. Kautta aikain tilastossa virallisia pelejä 222, joista Milan on voittanut 76 ja Inter on voittanut 79. Tasan on pelattu 67 kertaa. Näissa peleissä Inter on tehnyt tasan 300 maalia ja Milan 297, eli vain 3 maalia vähemmän. Myös viimeiset 5 kohtaamista on ollut tasaisia. Inter on voittanut 2 peliä, Milan on voittanut 1 kerran ja 2 kertaa on päättynyt tasan. Myös sarjataulukossa on joukkueiden välillä tasaista. Kun on pelattu 27 kierrosta, niin Milan on sarjassa 3. ja on kerännyt 51 pistettä. Inter on sarjan 4. ja on kerännyt 50 pistettä, eli vain pisteen vähemmän kuin Milanilla. Eli huominen peli on se kuuluisa 6 pisteen peli ja sen lisäksi derby..Huh huh. Joukkuiden vireessä on pieni ero. Milanilla on päällä (näennäisesti) kova vire, 5:stä viimeisestä pelistä on puhtaat 5 voittoa. Interillä on viime aikoina ollut kentän puolella ja kentän ulkopuolella sekoilua. Niinpä Interin 5:stä viimeisestä on Inter on voittanut 3 peliä, kerran joukkue hävinnyt ja kerran tasan. Toisin kuin Milan, Inter onnistui pääsemään Eurooppaliigassa jatkoon alkulohkosta. Mutta Inter onnistui tippumaan torstaina siitäkin, kun Eintracht Frankfurt haki Milanosta 1-0-vierasvoiton Luka Jovicin maalilla. Kun eka peli oli päättynyt 0-0 kiikareihin, niin saksalaiset jatkoi Euroopan valloittamista. 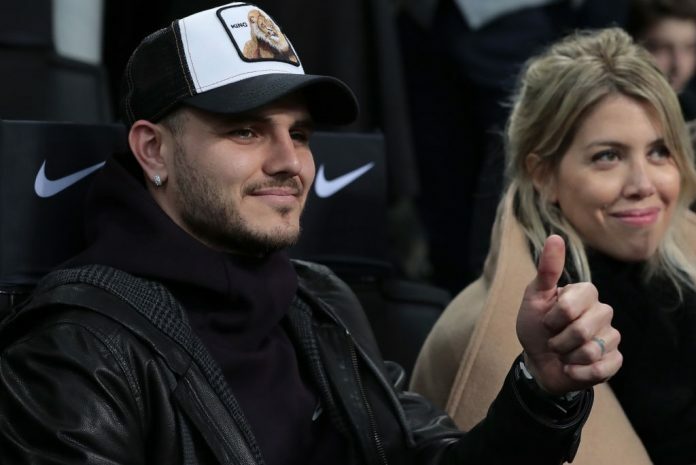 Mikä noissa Frankfurt-kohtaamisissa ja useammassa liigapelissä, niin Interin suurin tähti ja entinen kapteeni Mauro Icardi on istunut katsomossa, kun Interillä ja Icardilla on ollut erimielisyyksiä Icardin jatkosopimuksesta. Koko hommasta syntynyt semmoinen farssi, jonka vain Inter osaa rakentaa. "Every Derby has its own story. We must forget about the first game because it was another match. Over the last few days, I've heard people say that we’re favourites and that Inter are dead. Favourites don’t exist in derbies. We must respect our opponent, playing with heart, intelligence and desire. 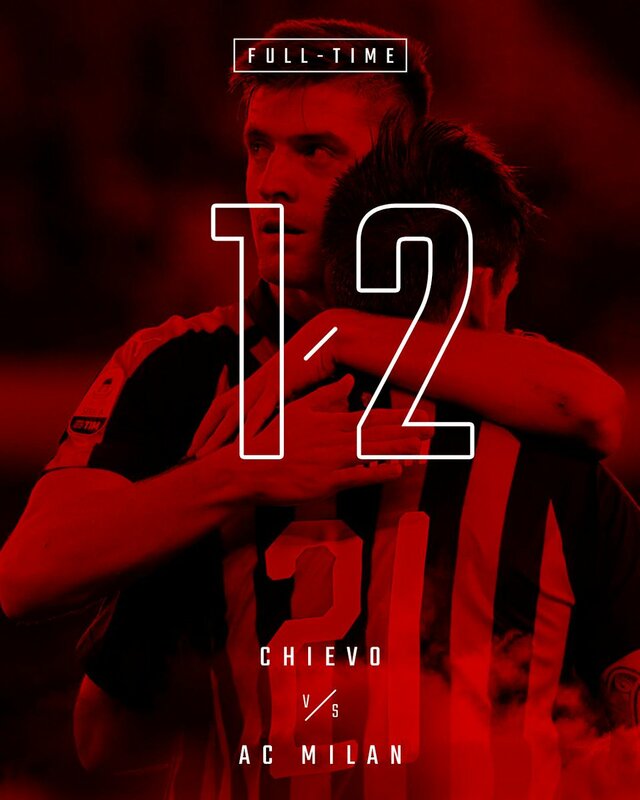 The San Siro will be packed out and the crowd must be our 12th man. It’s a game in which we have a lot to play for, however, we must not forget that there are still just three points on offer. I'm concerned about the mental aspect of our game in the aftermath should things not go well. However, winning would give us something more mentally." "We respect Inter because they have top players who can cause us problems. We must do well to cope with their pressing, unlike in the first game. Weìll need courage and I want to see a different attitude. I want clear heads and the team to show what we know they can do." "I don't see this match as an opportunity for revenge. I'm only focused on my objective, which is getting these lads back into the Champions League. Allegri seemed incapable after the result in Madrid, but he's since made people change their minds and now they’re praising him." 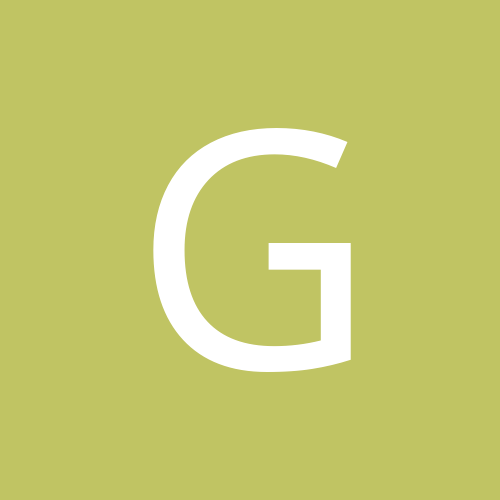 "There are some matches that you need to gear yourself up for, you need to talk and shout. However, this isn't the case for the Derby, the atmosphere is already there. Little shouting and few words: there’s already enough tension." "It's difficult to respond to this question. In my idea of football and talking about my players, I become the nastiest man in the world should someone show a lack of respect. Football teams are also built in the dressing room and respect is key. The dressing room is a sacred place." "We were knocked out of the Europa League in the first round. We must not fall into the trap that everything will be easy tomorrow. We must prepare for this game with humility, aware of Inter's strengths." 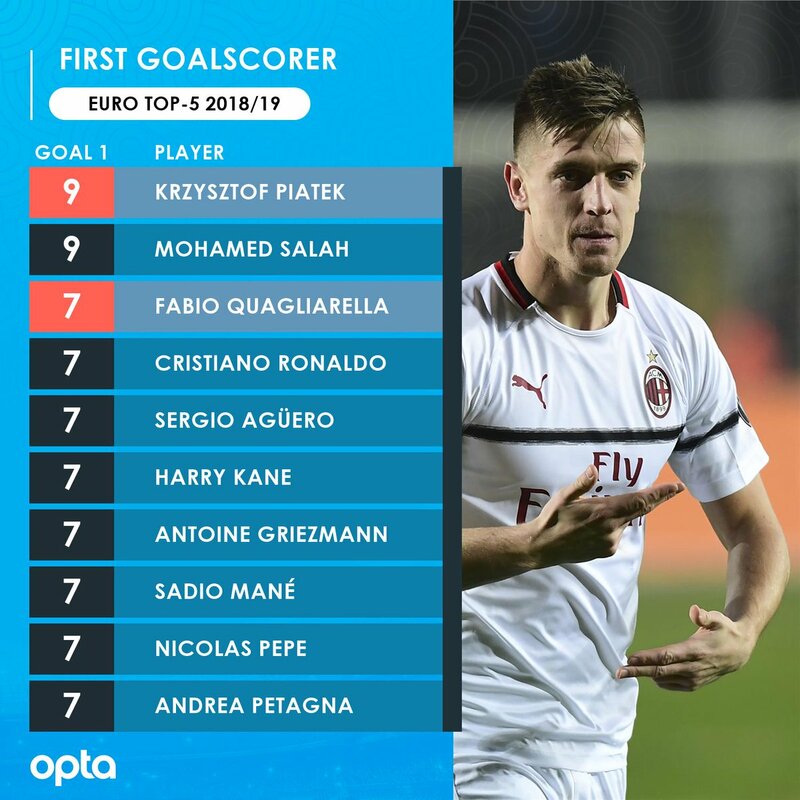 "The collective group must make the difference, and not just Piatek. I've seen just a few players in my life who can win matches by themselves. I don't speak with him often because he's not one who loves to chat. He likes to train and even comes in on his days off. 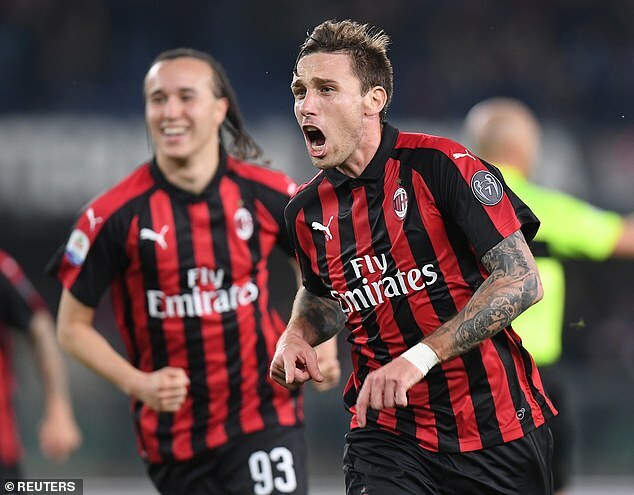 Biglia set to start? You'll see tomorrow. Musacchio? He's grown a lot, but everyone deserves credit for our defensive success and not just the defenders. He's not just physically strong, but he also rarely gives the ball away." "At the end of the day, results determine the fate of a coach. I'm only focused on working and achieving my objectives." "Discipline and respect are needed. The Coach counts for 30 percent and then the rest is down to teamwork. The lads are improving and they deserve credit. Sending off in Verona? If I want to become a good coach then I can’t afford to leave my team. It's already the third time that it’s happened." "The lads aren't physically tired. We're asking for more from some players, but that's different. However, it's important to be increasingly solid and compact." "I respect what he has to say, even if I'm the one who makes the decisions." "For a year and a half we were getting few fouls outside the area, but recently we've been getting more. We have plenty of free-kick specialists so I am sure that this will be added resource in trying to score." ”The negative performance on Thursday? There’s disappointment at what happened, that’s obvious. We needed to start the game differently, we also saw that in the first leg but the chance was there to make it through. We need to get back on track with our different roles, it’s clear that the result was a bitter one to take but we have to accept it. Now, it’s vital that the team is able to do well again. It’s true that we performed badly but there were other factors that made it a particularly difficult moment for us." "Finishing ahead of Milan? They’re a strong team as they’re showing at this moment in time but our aim is to finish in the top four, by finishing third or second if possible. Nainggolan won’t be on the bench. "The reverse fixture was a balanced game, we were only able to get the result in the final minutes. The derby is something that you can’t predict, how you play is what matters and the result will depend on this no matter what you want to happen. "Lautaro? 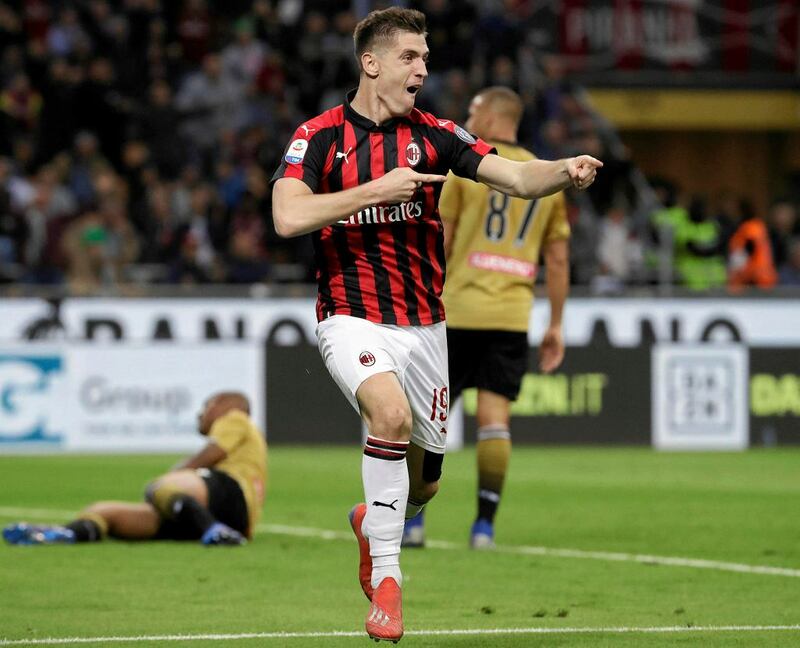 Both he and Piatek are great central strikers who pose a threat and can make the difference. The match itself will say who’s on top. Miranda? We’ll have a look at him tomorrow but it’s tough because it can be annoying to have to play with a mask. He wasn’t able to close his eyes for three days, his nose is still all swollen. It’ll be hard for him to recover. Brozovic? We think that we’ll have him back. Keita had a recovery session and didn’t report any issues so he’s clearly available. "Our certainties come from the colours we wear, our name and the number of points we’ve won. We also have opportunities, there’s only one point between us. I don’t see such a big gap between us, what hurts is when you don’t think you’re up to it and that’s not the case for us. We’re good enough for this match coming up and the Inter players are never left on their own." 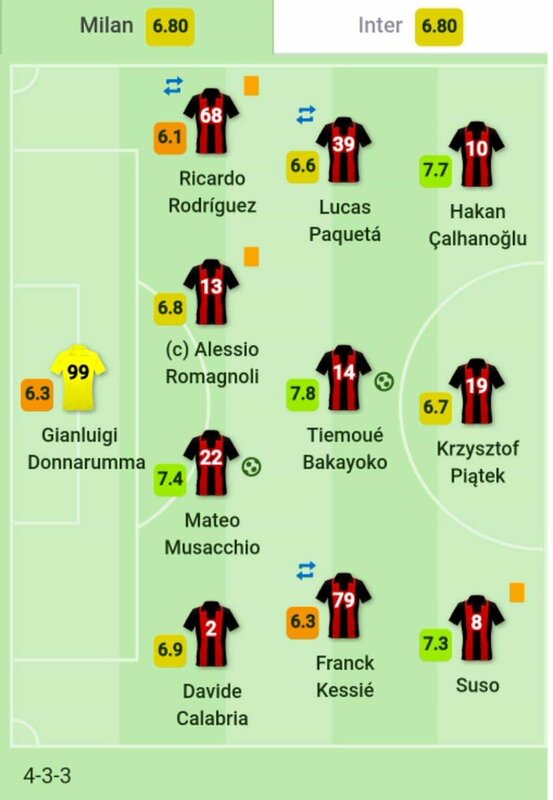 Borini, Calhanoglu, Castillejo, Cutrone, Piatek, Suso. 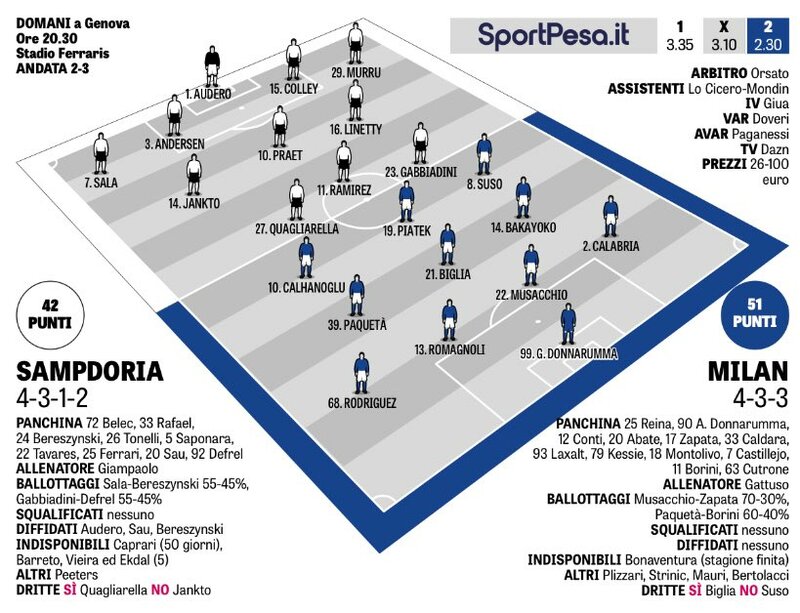 6 De Vrij, 13 Ranocchia, 18 Asamoah, 21 Cedric Soares, 29 Dalbert, 33 D'Ambrosio, 37 Skriniar. 5 Gagliardini, 8 Vecino, 20 Borja Valero, 44 Perisic, 77 Brozovic. 10 Lautaro Martinez, 11 Keita, 16 Politano, 87 Candreva. Jos on normaalistikin derbyn tuloksen veikkaaminen hankalaa, niin jotenkin tuntuu, että nyt se on erityisen hankalaa. Milan on mennyt ala-arvoisella pelillä voitosta voittoon ja kupla vain odottaa puhkaisua. Inter on taas sekaisin kossu ja kola kossukolassa. Tässä kannattaa muistaa silloin vanha derbysääntö, että kannattaa heittää sarjataulukot ja kuntopuntarit roskiin. Pelistä tulee tasainen vääntö todennäköisesti. Siihen uskoo Whoscored.com, joka ehdottaa 1-1 tasuria. Toisenlaiseen näkemykseen perustaa Goonersguide.com, joka ehdottaa Milanin 1-0 voittoa. Tuosta taas askeleen kiristää Freesupertips.co.uk omalla Milanin 2-0 voittoehdotuksellaan. Jotenkin se alkaa kuulostaa utopialta ja pelistä tullee tasaisempi. Se Milanin kupla puhkesi, mitä ennen peliä otaksuin ja pelkäsin. Inter ei ollut kovin hyvä joukkue, mutta otti loppujen lopuksi ihan ansaitusti pisteet. Milan oli taas kerran ihan surkea, vaikka pienestä loppukiristä on onkin annettava maininta. Milanin surkeuden huippu oli Interin avausmaali reilun 2 minuutin kohdalla. Siinä suunnilleen ihan jokainen Milanin puolustaja ja Donnarumma sählää sillä tavalla, että Vecinolla oli helppo homma laittaa pallo verkkoon. Taas on niitä pelejä, että on vaikea jakaa ruusuja. Itse valisen kuitenkin Bakyokon, joka väänsi keskikentällä niin kuin derbyssä kuuluu. Ei Bakayokokaan silti maaginen ollut, mutta voisi sanoa, että ainut Milan -peluri, joka oli omalla tasollaan. "We should have been more compact. We need to look back on the first half, we weren't at it in the first 45 minutes. For the first goal, we conceded from a seven on two situation. After that, we didn't deal with the high pressure. We're disappointed, but a team without the right mentality would have collapsed today. Inter are a great side that are going through a difficult spell. When it was 2-3, we could have scored." "In recent months, we've received plenty of compliments for our defensive work. I've always said that it's not just down to the defence when we haven't been conceding goals. Today was testament to that. We let him sneak in for the first goal and could have done better, we then made another mistake when the ball was put into the middle. In terms of attitude, we underestimated the opposition. On a technical level, we tried to create a number of chances. We need to get back to what we were doing." "It's another defeat. I'll talk to them in the next few days. I believe in the value of the group, in the value of men. This is where I've been consistent, and this hurt me because it means that someone hasn't understood what I believe in. For me, it's a big defeat on a professional level." Nyt on majutauko ja tauon jälkeen vastassa Sampdoria vieraissa. Siihen asti voi enemmänkin miettiä, että mitäs nyt sitten..
Jep. En sano että parempi voitti, mutta paremmin pelannut joukkue kylläkin. Milan nukkui kummankin puoliajan alussa ja muutenkin yli puolet porukasta pelasi todella surkeasti. Kehuja vain Bakayokolle, Musacchiolle ja Castillejolle. Muu joukkue voi katsoa peiliin ja miettiä missä oli oikea asenne. Mielenkiintoinen tapahtuma tosiaan myös penkillä, kun Biglia (ansaitusti) ripitti Kessietä kiukuttelusta vaihtoontulossa ja Kessie menetti kontrollin täysin ja yritti käydä Bigliaan käsiksi (Abate & co. estivät). Kessie pelasi ehkä kauden paskimman pelinsä ja jätti useassa tilanteessa puolustamisen kesken (kuten esim. Skriniarin puskussa pilkulta kohdilta --> onneksi pusku ohi maalin). Todella surkea ja huonoasenteinen esitys Kessieltä ja sitten vielä tuo räjähdys penkillä... Saisi luvan huilata ainakin pari peliä, sillä muutenkin suunta on ollut vahvasti alavireistä. Lisäksi Milanin pelinrakentelu tuntuu olevan liikaa Bakayokon varassa ja kaikki tiedämme, ettei se ole miehen vahvuuksia. Ja kun haukkumaan alettiin, niin haukutaan sitten kunnolla. Kessie, Suso, Calhanoglu ja Rodriquez osoittivat jälleen kerran eilen etteivät ole "Milan-tasoa". Turkkilaisen puolustukseksi sanottakoon, että viimeinen vartti oli aivan eri näköistä peliä kuin aiemmin tällä kaudella. Miksikö? Rooli vaihtui pirlomaiseen playmakeriin ja siinä Calhanoglu näytti olevan aivan eri luokan pelaaja kuin laiturina. Toivottavasti Gattuso huomasi saman! Muu em. kolmikko hukkasi pallon useaan otteeseen ja syötötkin olivat löysiä ja epätarkkoja. Suso oli täysin pimennossa (JÄLLEEN!) viimeistä varttia luk.ottamatta, mutta silloinkaan ei saanut kuin yhden kelvollisen keskityksen aikaan (josta 2-3 kavennus). Vaikka alkuun kiroilinkin ahkeraan Paquetan vaihtoonottoa (etenkin kun luulin ensin että Gattuso älysi ottaa Suson pois), niin vaihto osoittautuikin hyväksi. Vas.laidalle saatiin paljon enemmän vauhtia ja laatua kun Calhanoglu tippui alemmas. Vielä enemmän arvostan kuitenkin Gattuson toista vaihtoa, jonka seurauksena aivan karmean pelin pelannut Rodriquez katosi penkille Calabrian siirtyessä vasemmalle ja Kessien tippuessa oik.pakiksi. Parasta vaihdossa oli kuitenkin se, että Cutrone tuli Piatekin rinnalle toiseksi kärjeksi ja samalla sekunnilla Milanin hyökkäyspeli muuttui selvästi vaarallisemmaksi. 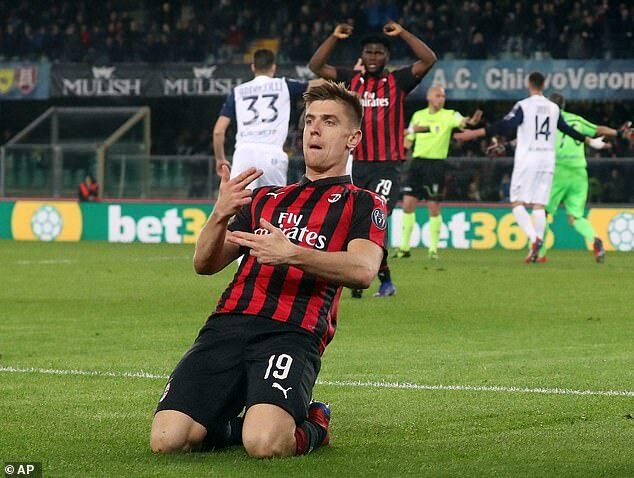 Piatek ei yksinkertaisesti kyennyt horjuttamaan Inter-puolustusta painiessaan yksin neljää Inter-pakkia vastaan, mutta Cutronen sisääntulo toi kummasti tilaa kummallekin ja boxiin heitettyihin palloihin tuli painettakin - vaikkei palloa kummallekaan hyökkääjistä saatukaan. Tilaa tuli kuitenkin muille(kin) ja hyvänä esimerkkinä onkin Castillejon nousu puskemaan takatolpalta Handanovicin olkapäähän. Myös kolmas vaihto oli hyvä: Kessie <--> Conti. Conti tarjosi niin hyökkäysvoimaa kuin jämäkkyyttä puolustukseenkin (vaikka monta rikettä antoikin). Ja rikkeistä puheen ollen... Tuomarityöskentely oli aivan katastrofaalista! Täysin identtisistä tilanteista vihellettiin annettiin täysin päinvastaiset tuomiot riippuen siitä, kummassa päädyssä tilanne sattui. Esim. Bakayoko taklasi muutaman kerran täysin puhtaasti palloon, mutta silti pilli soi. Myös esim. Asamoahin hypyt pallon päälle halimaan palloa tuotti jokaikinen kerta vaparin vaikkei esim. Cutronen päätyviiva"painissa" ei mitään kontaktia edes ollut. Kermana kakun päällä oli kuitenkin aivan käsittämätön rankkarituomio, jossa Politano itse ojensi jalkansa Castillejon jalalle ja vieläpä 16-viivalla - eikä edes alueella. Ei epäilystäkään kumman tuomari halusi voittavan. Vecino selvisi täysin selvästä ulosajosta pelkällä varoituksella, mutta Contille lätkäistiin punaista korttia tilanteesta, jossa ei ollut mitään aihetta punaiseen. Onneksi VAR-tuomarit sentään saivat taottua edes vähän järkeä seepran päähän, jotta tuomio muuttui. Mutta ei se silti kompensoi Vecinon pelin jatkumista törkeästä tempustaan huolimatta. Kokonaisuudessaan joukkue oli huono, mutta viimeiset 30min joukkue taisteli leijonan lailla ja jos sama asenne olisi ollut alkuvihellyksestä asti, olisi pinnoja taatusti tullut - useampikin ehkä. Punamustalasien läpi katsottuna ottelu oli saada ansaitsemansa päätöksen kun Cutrone pääsi mälläämään hyvästä paikasta erinomaisen pommin, mutta niin vain jotenkin käsittämättömällä tavalla D'Ambrosio onnistui laukauksen peittämään ja pallon maaliverkon sijaan päätyviivasta yli kulmaksi. En tiedä olisiko San Siron stadion muutenkaan kestänyt sitä yleisön räjähtämistä, jonka yleisön suosikkipelaajan yliajalla ampuma tasoitus olisi saanut aikaan... Valitettavasti se euforia jäi nyt kokematta ja tilalle tuli pari viikkoa kestävä *tutus. Aivan kuin kolmossijan menetys Interille ei olisi tarpeeksi, tappio sinimustille - vieläpä jo toinen tällä kaudella -, voittoputken katkeaminen ja vuoden ensimmäinen tappio aiheuttavat ihan tarpeeksi harmitusta. Tämä oli jälleen 1000 taalan paikka hoitaa homma kotiin, mutta sen sijaan päästettiin kakkossija lopullisesti karkuun ja Roma & Lazio hengittämään niskaan. Tai no, Roma onneksi hävisi ja pelaa ensi kierroksella Napolia vastaan, josta odotettavissa korkeintaan piste. Toivottavasti ei sitäkään. Valitettavasti helpolla ei Milankaan pääse kun joutuu matkaamaan Sampdorian vieraaksi. Noh... Onneksi on 2 viikkoa aikaa harjoitella pelaamista 4-4-2:lla tai tai 4-2-2-2:lla, jossa jompanakumpana laiturina onkin Castillejo ja kärjessä Cutrone & Piatek. Eikä mielestäni olisi lainkaan hassumpi idea laittaa Calabria vas.pakiksi Contin ottaessa oikean pakin paikka avauksesta. EDIT: Vielä sellainen huomio joukkueiden keskikenttäpelaajista, että Milanilla keskikentällä on raatajia, joiden vahvuudet on puolustussuuntaan. Interillä taas tuntuu sekä keskikentällä että ylempänä olevan pelaajia, jotka kaikki osaavat rakentaa peliä ja syöttötyöskentely on selvästi Milanin vastaavia parempaa. Ja kyllähän Interin keskikenttä osaa sen lisäksi puolustaakin riittävän hyvin, joten heillä on käytössään paljon monipuolisempaa tarjontaa. Mielestäni nuo yhden roolin pelaajat (jollainen Gattusokin oli) ovat jo historiaa - tai ainakin pitäisi olla -, ellei kyseessä ole aivan maailman huippu roolissaan. Milanilla ei sellaisia keskikentälle ole. Mieluummin pelaajia jotka ovat suht' hyviä kaikessa kuin niitä, jotka osaavat vain taklata erinomaisesti, mutta muussa ovatkin hyödyttömiä. Lisäksi sijoittuminen kentällä oli täysin ylivoimaista sinimustilla. Inter sai lukemattomia hyviä vastaiskuja kun pitkä avaus tavoitti keskialueella täysin vapaana olevan pelaajan, jonka nopea käännös ja juoksu ylöspäin tuotti vaarallisia tilanteita. En ole nähnyt vastaavaa vuosikausiin Milanin omassa pelissä. Lähimmäs tuota päästään Suson kautta, mutta niissäkin poikkeuksetta vastustajat ovat paljon lähempänä Susoa kun pallo tulee jalkaan ja toinen merkittävä ero on siinä, ettei Susolla ole vieressä lyhytsyöttövaihtoehtoa tarjolla kuten sinimustilla oli. Milanin joukkue makaa liian alhaalla eikä keskikentällä ole nopeutta riittävästi. Mikäli peliä pelattaisiin kahdella kärjellä, olisi toinen kärjistä aina käytettävissä lähimaastossa toisen kärkkyessä läpisyöttöä. Sanomattakin selvää, että 2 kärjen taktiikka toisi huomattavasti lisää vaarallisuutta ja ennen kaikkea vaihtoehtoja. Toki Suso voi nykyisellään pistää laidanvaihdon toiselle laiturille kärjen sijaan, mutta pallon lentorata tuplaantuu ja niin tekee myös puolustajan aika reagoida tilanteeseen ja siirtyä katkomaan syöttöä. Lisäksi ongelmana on myös se, ettei Calhanoglun nopeus riitä. Turkkilainen ei ole ehtinyt edes puoliviivalle siinä vaiheessa kun pallo olisi menossa boksin kulmaa kohti. Castillejo kyllä ehtisi, mutta harvemmin on kentällä. Kahdella kärjellä palloa ei tarvitsisi pelata niin pitkänä ja jopa suht hidas Cutronekin ehtisi aina tilanteisiin mukaan kun ei tarvitse lähteä nousuun omalta 16-viivalta. Olen tässä hiukan eri mieltä. Kyllä Milanin panssarivaunuosasto (Kessie-Bakayoko) osaa jalkapalloakin pelata, jos vertaa takavuosien jyriin, mutta ei niistä mitään pirloja tai messejä saa. Näen niillä paikkansa kentällä, kuten eilen Bakayokolla. No, Kessie oli umpisurkea, mutta ei sitä poista, että parhaimillaan Kessie on joukkueen parhaita. Valitettavasti niitä hetkiä on ollut tällä kaudella todella vähän. Viime kaudella niitä oli paljon. Tässä kysymyksessä päästään taas kerran peluutukseen ja taktiikkaa. Sarvikuono tykkää peluuttaa joukkuetta kovin samanlaisella idealla kuin Allegri aikoinaan. 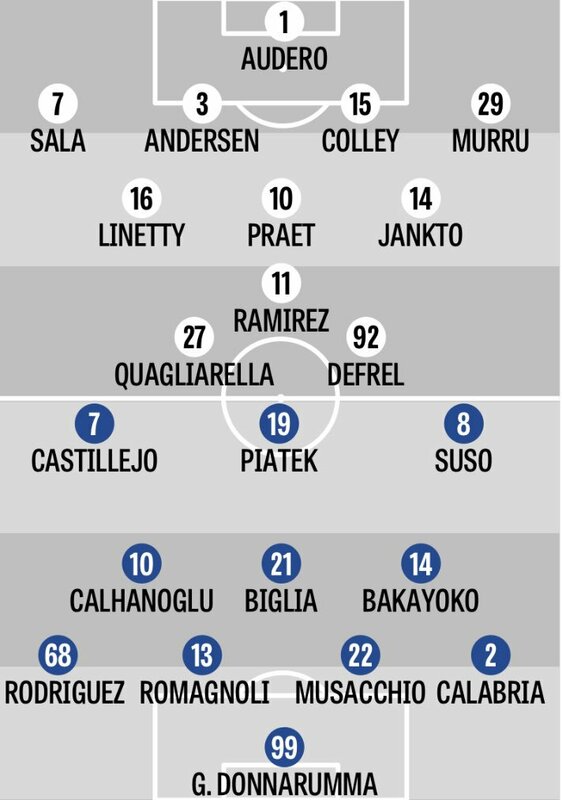 Silloinkin oli 4-3-3, jossa oli keskikentällä Muntari-Essien. 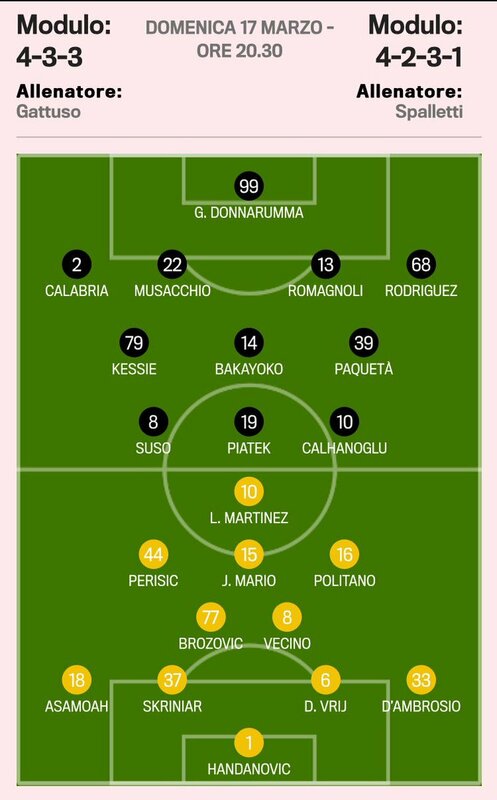 Nyt on 4-3-3, jossa on Kessie-Bakayoko. Allegri on myöhemmin Juvessa osoittanut kyllä taktisen kameolontin ominaisuuksia. Sen sijaan sarvikuono on sarvikuono, vaikka voissa paistaisi. Minusta tässä voisi kokeilla loppukaudesta, vaikka 4-2-3-1:stä. Siinä voisi laittaa Paquetan tai Calhalglun 10 -paikalle. Tai sitten se kuuluisa joulukuusi. No jotain tarttis tehrä..
Bakayoko ja Kessie kumpikin tekevät yleensä pelissä pari murtautumisyritystä 20m:stä boxiin, mutta ilman menestystä. Ei kertaakaan ole kumpikaan onnistunut noissa tilanteissa tällä kaudella. Aina karkaa pallo tai syöttö (noh, Kessie harvemmin syöttää ja laukoo mieluummin nollakulmastakin itse kuin tarjoilee vieruskaverille). Kumpikaan ei myöskään kykene antamaan puolustuksia avaavia syöttöjä tuolla viimeisellä neljänneksellä. Syöttövaihtoehdot ovat pääsääntöisesti viereen tai alas. Harvemmin ylöspäin. Ja silloinkin huonolla menestyksellä. Bakayokon itseluottamus on kyllä kasvanut ja omalle kenttäpuoliskolla myös syötöt eteenpäin napsahtelevat kohdilleen, mutta siellä 3/4-kentällä ei enää niinkään. Siinä se Milanin ongelma onkin. Joukkueelta puuttuu ne pelaajat, jotka antaisivat niitä HYVIÄ pystysyöttöjä myös siellä viimeisellä neljänneksellä. Inter-pelaajista tuntui jokainen tarjoavat laadukkaita palloja laitureille, jota jopa saivat pallot heti suojaukseenkin/kuljetukseenkin. Paquetalta tulee aina välillä jopa maagisiakin syöttöjä, mutta kun yleensä kohteena on Calhanoglu, joka sitten ryssii homman heti kättelyssä niin... Turkkilainen tosin eilen ainakin jakeli hyviä pystypalloja loppuhetkillä, joten jos kaverin pitää aina avauksessa olla, niin ehdottomasti sitten keskikentällä, jotta voitaisiin edes jollain tasolla saada jotain irti kaverista. Kuten sanoit... Jotain tarttis tehrä. Derbyketutus on ohi tai ainakin syytä olisi, kun Milan palaa majutauolta reissulla 580 000 asukkaan Genovan satamakaupunkiin. Siellä Milan kohtaa Sampdorian klo 21.30 Suomen aikaa 36 600 katsojaa vetävällä Stadio Luigi Ferraris -stadiniolla. Sampdoria oli 30 vuotta sitten yksi Italian parhaita joukkueita. Joukkue voitti scudettonkin 1990–1991. Sitten kaikki meni päin persepolista ja joukkue tippui 1999 Serie A:sta. Joukkue teki paluun pääsarjaan 2003-2004 ja ollut sen jälkeen alemman keskitason joukkue. Viime kaudella joukkue oli 10. ja keräsi 38 pelissä 58 pistettä. Tällä kaudella tahti on ollut aika samanlainen. Sampdoria on sarjassa nyt 9. ja on kerännyt 28 pelistä 42 pistettä. Milan sarjassa 4. ja on kerännyt 28:sta pelistä 51 pistettä. Milanilla on myös ihan hiukan parempi vire. Milanilla on 5.stä viimeisestä pelistä 4 voittoa ja 1 tappio derbystä. Sampdorialla on 3 voittoa ja 2 tappiota. 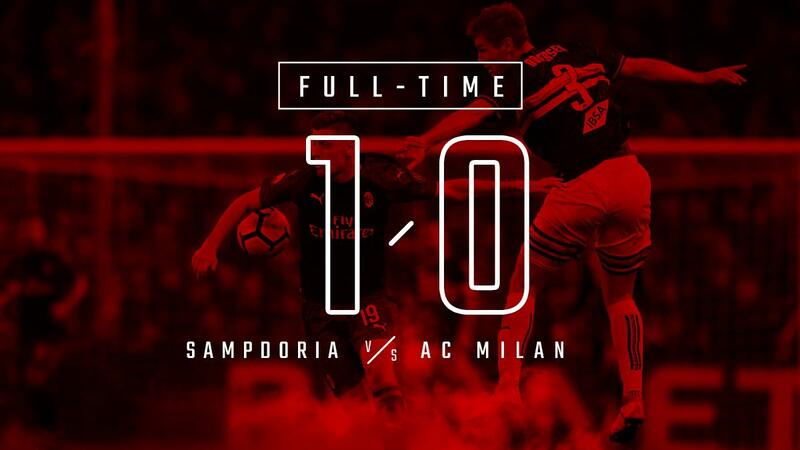 Sampdoria haven’t had much joy against AC Milan this season, having lost both previous meetings suffering misfortune in both, albeit in different circumstances. The Blucerchiati received a fillip in their last game as a swashbuckling performance saw them put five goals past Sassuolo. The international break has taken its toll on the Doria squad but the coach is hoping to patch up his players in time. “We’re proud to have so many internationals but this time we’ve ended up worse for wear. Another of Sampdoria’s internationals, Fabio Quagliarella, came back with a bounce in his step after becoming Italy’s oldest-ever goalscorer and Giampaolo acknowledge that his captain is very much the man of the moment. "We’ll be facing a side that have caused us problems this year, both in the league and in the cup. They’ve got good players up front with good movement and concede few goals. Furthermore, they have a great coach. We’ve trained well this week despite the great disappointment after the Derby game. We have ten finals in front of us and are playing for something important. We can’t lose our heads. I want to see an AC Milan side that we’ve become accustomed to seeing – one that doesn’t give anything away to the opposition. We need to return to being the side we’ve been in the past few months." "I got it wrong in the Derby by asking the lads to press high up the pitch. We played over 48 metres and not over 22, as we are used to playing. It was my mistake, but I think the most important thing is understanding where it went wrong. We lost a game that was the most important one we’ve played in recent years. It was a blow to lose, but it’s our duty to look forward and achieve Champions League qualification. We’ll do everything we can to achieve this objective." "I discussed things with him. I don’t hold grudges, but my players know how much I care about certain values. You need to respect everybody in the changing room. I was disappointed, but I won’t hold a grudge against him. During my playing career, I also got it wrong, as can be seen with what happened with Jordan. I’ve always faced up to it and paid a full price for it by taking full responsibility for my actions. The Club also always let it be known that I had done something wrong. After AC Milan v Tottenham, Galliani wanted to take the armband off me to send out a message, but the team opposed this." "Paquetá also played in the mezzala position in midfield while at Flamengo. When he plays for Brazil he does less defensive work, but the way he’s playing is not surprising to me. Suso? I don’t know if he’ll be out on the pitch tomorrow. We need someone who’s always involved in the game. He can give us a lot, and I think we need to continue to show confidence in him." "Playing in such a stadium is a dream, here you breathe the air of football. But in modern football, owning a stadium is really important – you just have to look at Juventus. You need to understand what a club that wants to return to greatness and be competitive again needs." "You’ll know about my future in two months. This isn’t the priority, we’re just thinking about achieving our objective at the moment." Sampdoria ei tule olemaan helppo nakki. Joukkue on ihan hyvässä vireessä ja jos Gattuso ei ole keksinyt pyörää uudelleen, niin matsista on olettavissa tasainen vääntö. Siihen uskoo Whoscored.com, joka ehdottaa 2-2 tasuria ja Freesupertips.co.uk, joka ehdottaa 1-1 tasuria. Samaa linjaa on Goonersguide.comin Milanin 1-2 vierasvoitto. Ollaan postiviisia ja uskotaan siihen. Ja tässä Suomifutiksen juttua illan pelistä. Tiivistetään näin: *ttu, Milan on paska. Ei siinä muuta kai tarvitse sanoa. Tuomarityöskentelystä sanon sen verran, että käsittämätöntä, että Interiä vastaan yhden väärän vihellyksen perusteella yksi tuomari hyllytetään kauden lopuista Inter-peleistä kokonaan, mutta matsista toiseen Orsato saa aina vaan ratkoa näitä pelejä Milania vastaan. Päivänselviä rankkareita jäi tänäänkin viheltämättä ja tuo lisäajan rikehän oli päivänselvä kun pakki rikkoo ensin Piatekiä ja vasta sitten hipaisee palloa. Mutta joo, ei auta itku. Jos oli tuomari paska, niin sitä oli koko Milan-joukkuekin. Conti toi selvästi laatua lisää Rodriqueziin verrattuna (joka saa mun puolesta pakata laukkunsa jo nyt ja lähteä menemään). Samoin Paqueta oli pirteä ja jakeli upeita syöttöjä, joita ei osattu hyödyntää. 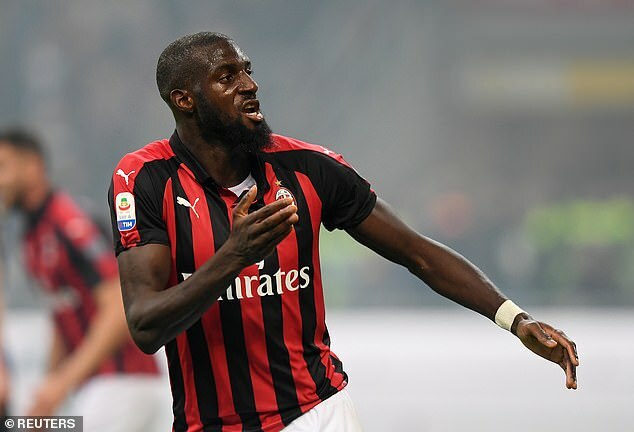 Bakayoko on sitten se kolmas kehuja saava ja Milanin paras - jälleen kerran. Nyt kun Lazio ottaa rästipeleistään täydet pinnat, niin Milan löytääkin itsensä UCL-sijojen ulkopuolelta. Katsotaanpa vaan, niin molemmat roomalaiset nappaavat huomenna 3p ja painelevat ohi viimeistään ensi viikonloppuna kun Milan saa oppitunnin jalkapallosta Juventus-stadionilla. Sitä ennen taidetaan kuitenkin nysvätä 0-0 tasuri Udinesen kanssa ja sitten voidaankin jättää hyvästit ensi kauden Mestarienliigalle. Onneksi sama kohtalo odottaa Gattusoa. Toivoa vain sopii, että Milan voittaisi Interin edessä yhdessä asiassa tällä kaudella... Nimittäin Antonio Conten nimmarin saamisessa sopimuspapereihin. Varsin epätodennäköistä sekin, sillä miksi Conte tulisi tuollaista paskaporukkaa vetämään? Eipä siihenkään ole realistisia mahdollisuuksia ilman UCL:ää, sillä joukkueella ei ole rahaa yhtään mihinkään ilman nelossijaa. Tai no... Rahaa tulee myynneistä, sillä aivan varmaa on, että Donnarumma, Suso ja Romagnoli lähtevät jos (kun) UCL:ää ei ensi kaudellakaan pelata. Tiivistetään näin: *ttu, Milan on paska. Ei siinä muuta kai tarvitse sanoa. Olet asian ytimessä. Itsellä oli eilen joku suojeluenkeli, kun ensin oli ongelmia streamin kanssa ja lopulta nukahdin kesken pelin. Mutta enpä mitään menettänytkään. Samaa paskaa se oli, mitä se on ollut pitkään ollut. Gattuson yltiövarovaiset taktiikat on johtanut siihen, että hyökkäyspelaamisessa ei ole mitään ideaa ja nyt puolustuspelaaminenkin on alkanut sakkaamaan. Tämä on tosiaan ihan kuin Mourinhon ManU:ssa..
Tämä on taas niitä matseja, joissa on vaikea ketään kiittää. Enkä myöskään aio niin tehdä ja niinpä mun MotM -palkinto jää jakamatta. "We played better than we did against Chievo and in other games that we've won. I'm not seeing a team that is completely off its game, but we got it wrong in the first half, when the difference between the sides was their level of quality. After the break, we increased the pressure, managing to do much better than what we did in the Derby. But one fact still remains: we're standing here talking about another defeat." "He made a mistake, but this is part of the game." "It would be easy to say something about the referee now. I like VAR. If Orsato has made a mistake, those in charge will make sure he'll pay the consequences for this. Nevertheless, I think it was a decision made in good faith." 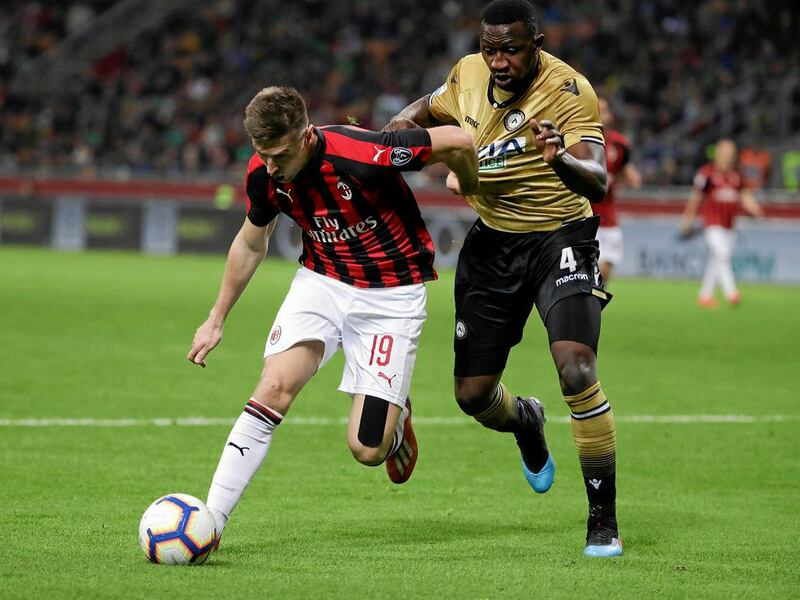 "There wasn't a problem with Kessie, it was simply a choice made on a technical basis. Bakayoko? He grew into it in the second half, I was pleased with him. Calhanoglu? He has the qualities to play using just two touches. Physically, he's fine, and he's managing to keep the tempo high playing from a midfield position." Ja tosiaan seuraava peli on jo tiistaina, kun Udinese saapuu kylään San Sirolle. Ei tässä ole aikaa jäädä itkemään, vaan jatkettava taistelua. 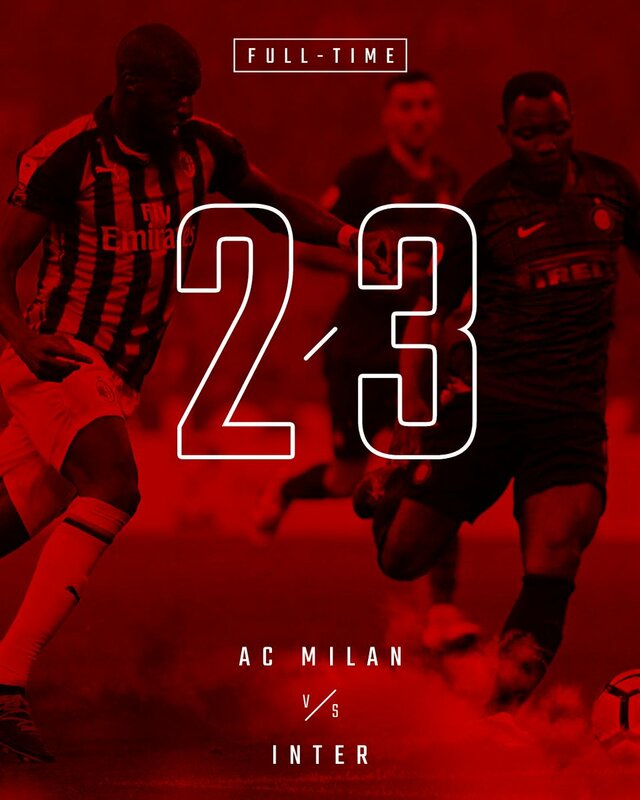 AC Milanin nuoren tähtivahdin Gianluigi Donnarumman nolo munaus maksoi seuralle lauantaina tärkeitä pisteitä sarjaottelussa Sampdoriaa vastaan. 20-vuotias italialaistorjuja syötti pallon erehdyksessä suoraan Gregoire Defrelillä, joka iski tilanteesta 33 sekunnin pelin jälkeen ottelun voittomaaliksi jääneen 1-0-osuman. Tappiosta huolimatta Milan on sarjataulukossa neljäntenä ja taistelee paikasta Mestarien liigaan. Donnarumma pyysi ottelun jälkeen harmittavaa virhettään anteeksi. 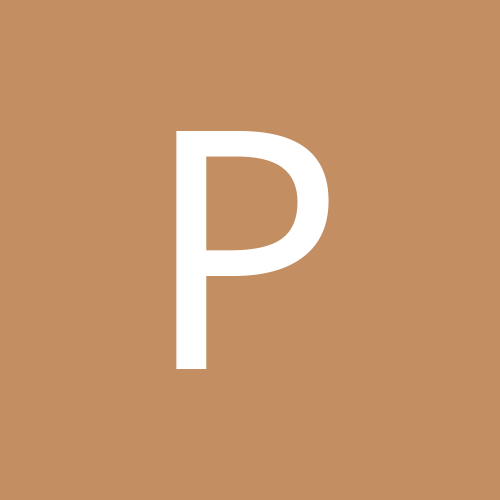 – Kiitän joukkuetovereitani tuesta. Virheitä sattuu ja pyydän siitä jokaiselta anteeksi, Donnarumma pahoitteli Milan TV:lle. – Kun koitat pelata omasta päästä palloa, virheitä voi tulla. Olen pahoillani, ettemme pystyneet nappaamaan edes pistettä. Minulla oli viime vuonna hankalia jaksoja. Jos selvisin niistäkin, selviän tästäkin. Maalivahtina ei voi jäädä murehtimaan asioita. Milan saa huomenna vieraita idästä Udinesta, kun Udinese Calcio saapuu San Sirolle klo 20.00 Suomen aikaa pelattavaan matsiin. Udinese on suhteellisen perinteinen seura, joka pelaa Serie A:ssa 46:kautta. Historiaan mahtuu pääsarjasta nousemisia ja tippumisia. Kulta-aikaa joukkue vietti vuosituhannen vaihteessa, joilloin joukkue osallistui jopa Mestareiden liigaankin. Nykyään joukkue on taas alemman keskitason joukkue, joka joutuu taistelemaan enemmänkin sarjapaikasta kuin europaikasta. Viime kaudella joukkue oli 14. ja keräsi 38:sta pelistä 40 pistettä. Ja sama tahti on jatkunut tällä kaudella. Udinese on kerännyt 28:sta pelistä 28 pistettä. Sillä joukkue on 16. Milan on yhä 4. ja on kerännyt 29:sta pelistä 51 pistettä. Joukkueiden vireessä ei ole eroa. Molemmilla joukkueilla on 5:stä viimeisestä pelistä 3 voittoa ja tappiota. "For us, it's a vital match. We need to approach it with a great sense of desire but also a sense of calm. It's an obligation that we win. 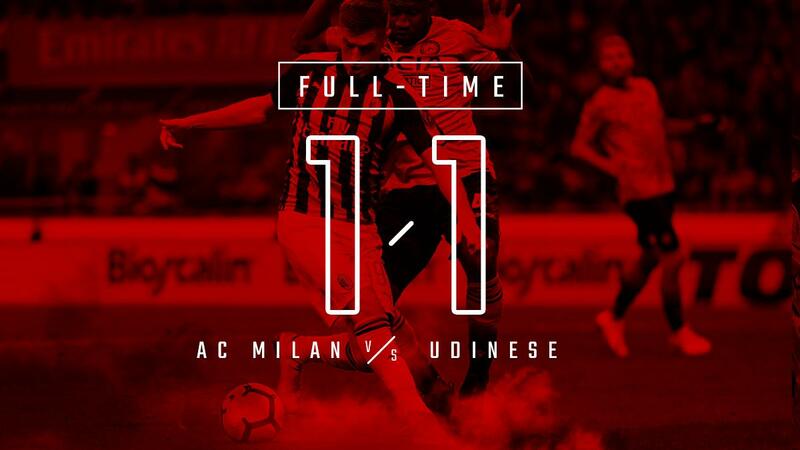 Udinese come into the game on the back of a 2-0 win, we focusing on not underestimating the task we have in front of us. We shouldn't think about third position, fourth position or the distance between ourselves and those chasing us." "We come into this game on the back of two bad results, but the group fills me with hope: we're alive and doing all we can. We could have scored in Genoa, we actually played better in spells against Inter and Sampdoria than we did against Sassuolo and Chievo – matches which we won. Referees? I don't want to look for excuses. Just as we have to study the opposition, we also need to know the style of every single referee. 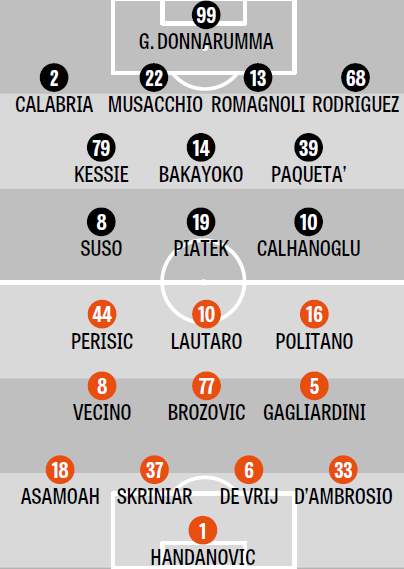 There were two key moments against Sampdoria, but we needn't say anything about this. I believe the referees make decisions in good faith." "We were all rowing in the same direction before too, I'm calm. No one can question the unity that exists between me, Leonardo and Maldini. Our characters mean that we say things to each other directly. My current aim is to bring AC Milan back to the Champions League. In my last press conference, I could have said nothing, but I like to say it how it is and tell everyone what I think: I have my good points and my weak spots. What counts is the Club, everything else is of secondary importance." "We're missing a sense of calm and recently we've been a bit too frantic in our performances. We need to approach our matches better and get back to winning ways. It's not true that we're struggling physically. We have something different in mind for tomorrow's match, but we'll mainly do the preparations for it tomorrow. We're playing for a lot, qualifying for the Champions League would be our own personal Scudetto. I don't get carried away with wins or defeats because I want to remain level-headed after every win. I like listening to my players and then leaving them in peace. When you lose, the atmosphere isn't so good, but this means that the players care a lot. I don't enjoy losing, it hurts inside. However, we're still alive and everyone needs to shoulder the responsibility." "Caldara has been training with the group for around 20-25 days. He's doing well and he's improving physically. We created chances in both the Derby and against Sampdoria. The teams must be more proactive and look to hurt their opponents, also helping Krzysztof up front. As a mezzala, Bakayoko has provided us with both quantity and quality. He struggled during the first half but then improved. Donnarumma's mistake is part of football. I liked his reaction, he shown maturity. I also liked what Conti had to say. Two or three in defence? We'll see. Kessie and Biglia had an argument and they were wrong to do so, but it's now in the past. The Club and I were disappointed but there's no controversy that remains. No punishment or anger. Paquetá? Before, there were complaints that he was always playing, whereas the one times he starts on the bench, I then read the complete opposite." Toisaalta on huhuja, että Gattuso uskaltaisi vihdoin kokeilla muitakin formaatioita. pake ehdotteli Sampdorian pelin jälkimeiningeissä 0-0 tasuria. Se on kyllä loistava arvaus ja yhtä aikaa aika synkkä arvio. Samantyyppisellä linjalla menee Whoscored.com, joka ehdottaa 1-1 tasuria. Sen sijaan Freesupertips.co.uk uskoo Milanin 2-0 kotivoittoon. Voi tuota optimismia..
Pari mielenkiintoista faktaa statistiikasta. Ensinnäkin, maaottelutauot tekevät kovasti hallaa Milanille. Kyseisten taukojen jälkeen viimeisistä 16 sarjapelistä Milan on voittanut vain yhden(!!). Liikaa maajoukkuepelaajia ringissä? Treeneissä tehdään asioita pahasti väärin? Vaikea sanoa. Eipä vaan Juvet yms. maajoukkuepelaajia täynnä olevat muut seurat nuku noin pahasti maaotteluiden jälkeen. Toinen fakta onkin sitten vieläkin synkempi kun ajatellaan huomista. Tuomarina häslää muuan Luca Banti. Ei ihme, että kaverista on tullut inhokkini numero kaksi. Milan ei nimittäin ole voittanut ainuttakaan viimeisestä yhdeksästä(!!) pelistä, joissa Banti on ollut "jakamassa oikeutta"! Tiesin, että vihaan kaveria, sillä vihellykset ovat poikkeuksetta aivan p*stä, mutta puskista tuli tuo tieto, että tosiaan voitoitta ollaan kontattu ihan käsittämättömän pitkään. Ei voi oikeasti olla pelkkää sattumaa vaan kyllä tuossa on viitteitä ihan systemaattisesta Milanin vastaisesta tuomaroinnista. Miettikääpä nyt. Yhdeksän peliä ilman voittoa. Tuleeko huomenna kymmenes? Hyvin lähellä ollaan. Ja nyt kun Contikin huilaa huomenna venähdyksen vuoksi, on Rodriquez taas roiskimassa palloja päätykatsomoihin tai vastustajille eli vasen laita on täysin poissa pelistä (etenkin jos Calhanoglu on tutulla laitahyökkääjän tontillaan täysin näkymättömän Castillejon sijaan). Noh... Kärsimystä ja tuskaa luvassa, mutta niin sitä vaan taas huomenna naama ruudussa kiinni seurataan Gattuson "miesten" surunäytelmää. Nyt oli pakella kovaa statistiikkaa..
Tässä GdS:n arvio avauksista. 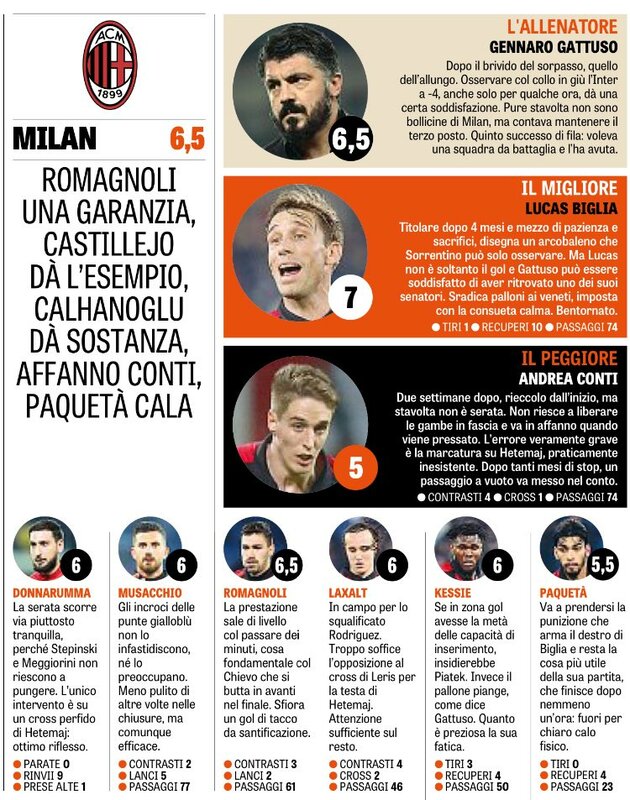 Milan on vaihtamassa 4-3-1-2:een. Karuja tilastoja, jotka pitää laittaa kumpikin ihan eri uskoon niin pian kuin mahdollista. Mutta itse peliin... Kessie lienee loukkaantumisen vuoksi sivussa ja Laxalt aloittanee Rodriquezin paikalla. Susoakin huhuillaan keskikentälle, joten nyt on kerrankin jännitettävää sen suhteen ketä kentälle pääsee ja mille paikoille. Ei enää kausikorttilaisia vakiopaikoille! Ja tuo asia on pelkästään positiivinen juttu vaikkakin loukkaantumiset myös vaikuttavat tilanteeseen. Ja tärkeintä on se, että V-I-H-D-O-I-N nähtäneen Milan vanhojen hyvien aikojen "2 kärkeä ja piilokärki"-taktiikalla liikkeellä! Olen huutanut tämän perään jo kohta vuosikymmenen ja nyt sitten nähdään mitä se tuo tullessaan. Ei se hyökkäyspeli voi ainakaan yhtä olematonta olla kuin viime aikoina 4-3-3:lla, jossa ollaan sille (HYVIN) yksinäiselle kärjelle saatu luotua peräti yksi maalipaikka. Eli tänään kun saadaan yksikin maalipaikka Piatekille, niin ollaan jo ylletty samaan kuin 4-3-3:lla saadaan aikaan. Joopajoo. Meni Paqueta, pisteet, UCL-paikka ja yöunet. Homma täysin kontrollissa puoliajalle mentäessä, mutta kopista tulivat vain Bakayoko, Cutrone ja Castillejo ulos. Muista ei näkynyt merkkiäkään jälkimmäisen 45min aikana. Olen hokenut "karmeaa paskaa"-mantraa aika usein, mutta nyt jos joskus se pitää paikkaansa. Jo 50min kohdalla joukkue vain odotteli loppuvihellystä eikä viitsinyt edes yrittää enää lisämaalien tekoa. Kyllähän merkit olivat pitkään ilmassa siitä, että tasoitus tulee vielä ja niinhän siinä kävi. Ja todetaan nyt vielä tämäkin asia about kymmenettä kertaa: toivottaavasti tämä oli viimeinen kerta kun näen Abaten Milan-pelipaita yllä kentällä! Ei kaverista ole muuta kuin haittaa. Ja sama pätee (EDELLEEN) Calhanogluun ja Bigliaan. Säälittävintä tässä paskassa joukkueessa lienee se, että Biglian pitäisi olla se suuri playmaker, joka rakentaa peliä, mutta kaverin itseluottamus on niinkin korkealla, että joka kerta kun pallo tulee jalkaan, ensimmäisenä otetaan suunta kohti omaa maalia ja syötetään pallo alaspäin. Etenkin viimeisen kympin aikana kun muu joukkue (tai no, osa siitä...) haluaisi tehdä maalejakin vielä. Eipä tarvi ensi talvenakaan uhrata ti/ke-iltoja jalkapallon seuraamiseen. Jos sarjan tyvipään porukkaan kuuluvan Udinesen kanssa tysvätään hyvin nihkeät 4p koko kaudella, niin ehkäpä se vain tarkoittaa sitä, että Milan on pari-kolme sijaa kovempi joukkue kuin putoamista vastaan taisteleva Udinese. Ei tällä joukkueella ainakaan UCL:stä kannata haaveilla, sillä ei yksinkertaisesti ole mahdollista, että sekä Inter, Lazio, Roma sekä Atalanta kaikki ryssisivät loppukautensa milanmaisesti. Roma ehkä ryssiikin, mutta että kolme muutakin? I don't think so. Kyllä tämä oli nyt tässä. Eurooppaliiga kutsuu. Jos sekään. Ja vaikkei ottelu tuomarityöskentelyyn ratkennutkaan, niin kylläpäs Banti sai taas sellaiset *tutukset aikaan, että...! En voi käsittää miten 95% tuomioista suosi Udinesea. Behrami veti kyynärpäällä Cutronea naamaan --> ei mitään. Udinesen pelaajat lentelvät nurmen pintaan omia aikojaan ilman kontaktia --> joka kerta vapaapotku. Ei tuo mitään jalkapalloa ollut. Ehkä lähempänä jotain balettia tai hippaa. Eri joukkue ja eri säännöt? Tämä oli peli, jonka lopputulos oli sitä ihteään. Olen aivan samaa mieltä, että pelin eka puolisko oli ihan hyvää. Tai oikeastaan siihen asti Paqueta telottiin vaihtoon. Paqueta oli todella hyvä 10-paikalla. Samaa ei voi sanoa tilalle tulleesta Samusta, vaikka parhaansa yritti. Muutenkin tämä uusi timanttimuodostelma toi kyllä tiettyä pirteyttä, kun pelaajien pään sisään rakentunut jarru jäi vähemmälle. Kuten aina, niin nytkin toiset pelaajat hyötyy formaation vaihdoksesta. Hakan pelasi ihan mukavan pelin ja peli kulki enemmän turkkilaisen kautta kuin oikean puolen Bakayokon, joka jäi aika näkymättömäksi. On turha vielä sanoa, että onko 4-3-1-2 se viisasten kivi. Eilen oli samat vanhat ongelmat maalipaikkojen luomisessa. Palloa potkittiin enemmän topparien välillä keskikentällä kuin, että sillä olisi mitään vaarallista luotu boksissa. Mutta joo, sitten siihen saisseen. Tosiaan putoamistaistossa oleva joukkue iski maalin terävästi vastaiskusta Milanin kulmata. Sen jälkeen punamusta jättiläinen oli ihan sekaisin. Koko toinen puoliaika oli sitten sitä ihteään ja näennäisestä Milanin hallinnasta huolimatta Udinesella oli varmaan paremmat paikat ja siten vierasvoittokaan ei olisi ollut vääryys. Bantin tuomiot kyllä suosi Udinesea. Tosin mitään suurta oikeusmurhaa ei sattunut, mutta kyllä idän pojat sai aika kovaa pelata kotijoukkuetta vastaan, joista olisi voinut joutua useampikin pelaaja sarastuvalle kuin Paqueta. Motm:ksi on muutama vaihtoehto. valitsen kuitenkin Pepe Reinan, joka joutui maalille kesken pelin ja pelasi hienon pelin. Maalille spanski ei voinut mitään. Oli suorastaan viihdyttävää seurata Reinan jalla pelaamista. Lauantaina on Juven kohtaaminen Torinossa. Näiden Milanin otteiden jälkeen en budjetoi yhtään pistettä siitä reissusta..
Ja mikä "parasta", Juve-pelin jälkeen onkin kauden tärkein peli kun vastaan asettuu Lazio. Näiden kahden pelin myötä Milanin voitottomien pelien putki venyy jo viiteen. Tässä vaiheessa kautta se on täysin anteeksiantamatonta ja viimeistään se maksanee Gattuson pestin. Ei heti, mutta kesällä sitten. - Suso paranemaanpäin, mutta lauantai saattaa tulla liian pian. 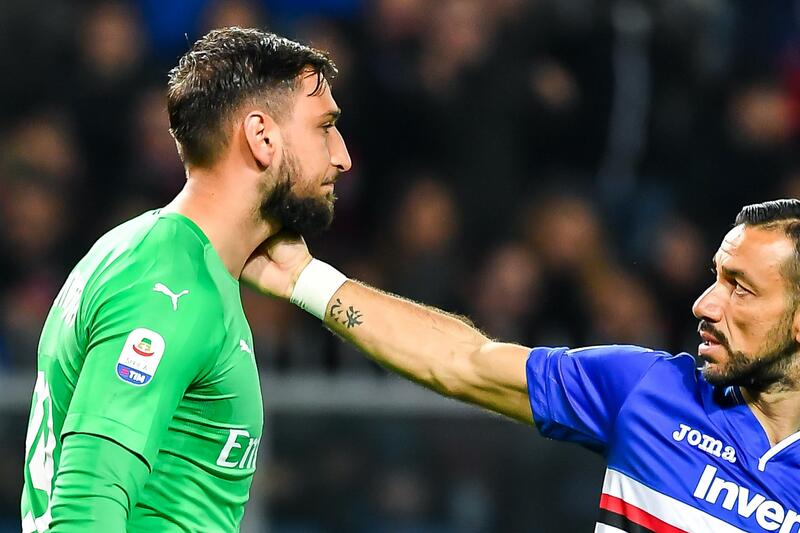 - Donnarumma missaa ainakin Juven ja Lazion. Yhden arvion mukaan jopa kk sivussa. - Paquetaa tutkitaan tänään lisää. Sivussa todennäköisesti viikkoja. Jos nivelsiteissä vikaa, voi olla pidempäänkin. Jos jotain positiivista oikein hakemalla hakee, niin Milanilla on 3-7 sijoilla olevista joukkueista yksi helpoimmista otteluohjelmista jäljellä. Reilu viikko sitten laskeskelin että jäljellä 3-4 kovaa vastusta ja 7-8 helppoa (tai no sanotaanko vaikka että "ei kärkikahinoissa mukana olevaa", sillä Milanin suoritukset sarjajumboja yms vastaan tiedetään). Juve, Lazio ja Fiorentina ovat nuo kovat pelit ja lopuista vahvin lienee Torino. Oli miten oli, noita kolmea lukuunottamatta muista pitäisi kairata vähintään 5 voittoa, mutta pelaajatilanteen ja joukkueen motivaation/asenteen ollessa mitä on, taitaa olla mission:impossible (ilman hollywood-loppua). Paperilla kaikki on vielä mahdollista, mutta viime aikojen tapahtumat veivät minun uskon ja luottamuksen 4.sijaan. Tekee tiukkaa saada edes Eurooppaliigapaikka pidettyä toukokuun lopulla.